The holy month of Ramadan is underway in all Muslim countries along with other countries with more or less Muslim population. Muslims all over the globe are following a particular routine in this unique month by abstaining from food for most part of the day and try to attain moral and spiritual growth. This schedule impacts on most of the businesses not only in Muslim countries but also businesses on global scale. Despite being an assumption about the negative effects of Ramadan on businesses, the reality is completely different. The holy month not only increases scope of several types of businesses but entrepreneurs and even ordinary persons can expect to grow their new businesses in Ramadan. 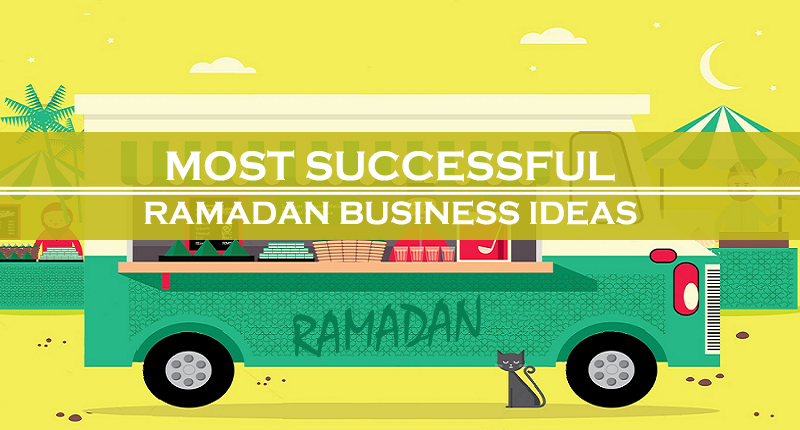 Following are few of the businesses and commercial activities that provide best results during the holy month of Ramadan and one should start thinking about taking advantages of these new business opportunities in Ramadan. Different countries and cultures have their own favorite foods that they enjoy during Ramadan. But they came in the same category as mentioned above. Different fried and baked items along with various types of sweets are largely consumed in all parts of the Muslim world. The names and ingredients of these items may be different in different areas but they fulfill same purpose during Ramadan. That is to replenish the energy requirements of person after long hours of fasting. Preparing and selling such types of products will surely result in acquiring large profits during the month of Ramadan. It is because such products are consumed in large amount as compared to routine months. Businesses dealing in other items can start such activity for one month for additional profits. It is difficult for small merchants to prepare these items in large numbers and they can sell already prepared items after purchasing them from vendors on regular basis. It will cost them less and they can get profits by selling them to commoners. Ramadan is month of salvation and prayer but it ends with the joyful festival of Eid. In different parts of the world, Muslims start preparations for Eid after half month of Ramadan. The most important items for Eid are new clothes and jewelry. There is no way that one may lack profits after dealing in clothes and jewelry during Ramadan. There are lots of companies selling such products and their business will boom during Ramadan. These companies and brands can increase their business several folds by taking special measures and announcing promotions on different products. But the opportunities are not limited to already establish businesses. People can also start new business by selling clothes and jewelry for one month. Due to high scope, there are immense chances of growth of both big and small business in Ramadan. Ramadan is a month of giving. Muslims usually tend to give more to needy persons during Ramadan. As an entrepreneur, you can make the things easier for them by selling different Ramadan gift packs. These gift packs usually contains various eatables consumed in Ramadan. Only using a little technique and effort can help you maximize your profits in the holy month. Same is the case with Eid hampers and gift packs. People usually visit their relatives and friends on the occasion of Eid soon after Ramadan. It is accustomed to give different gift items to them. You can utilize this for increase in your business. Just neatly pack few sweets, eatables and simple jewelry for the purpose and it will produce positive effects on your business. On many occasions, not only individuals but even families prefer to open iftar and having their dinner outside amid tiredness of Ramadan. This activity is especially followed on weekends. This opens new opportunities for businesses related to food and beverage industry. Small and new entrepreneurs can also take full advantage of this situation by setting up their stalls in different populated areas. These stalls can offer cheap and healthy food to make their place in the already stuffed market. There is no reason to doubt about the profits one can gain in just one month long business in any Muslim country or any area with Muslim population. Like previous several years, Ramadan this year is also coming in summer season (all Muslim countries are in northern hemisphere where summer season is from April to September). It clearly means that the demand of nutritious fruits along with natural and artificial drinks is quite high. This opportunity can be availed not only by professional companies that sell such products all year around but also by ordinary business-minded people. By providing fresh and healthy fruits and juices at affordable rates, you can expect hefty profits that are only exclusive to the holy month of Ramadan. These are just few of the several businesses that grow steadily during the whole month of Ramadan. If you are thinking about a related business or any other business, then you can make use of such opportunities in Ramadan to do an experiment and get knowledge about business techniques and ethics. If you are interested in any such or other business in UAE, then you can contact Riz & Mona Consultancy via our WhatsApp # 971-56-9971225.